Lesson 105: Small Grammar Points! The title of this lesson is: Grammatical principles that I can’t believe I haven’t taught you yet – and I better teach them to you now before we get too deep into more difficult grammatical principles in Unit 5. 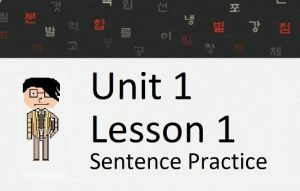 In this lesson, you will learn a variety of smaller grammatical principles that you absolutely need to know to be able to speak/read/understand Korean. In the summer of 2014, I had a few weeks off from work and set a goal for myself to read a Korean novel in a week. I did this for two reasons. One, I wanted to challenge myself and benefit from the vocabulary increase and reading practice I would get from reading the book. Two, I wanted to see if, in that entire book, there were any grammatical principles that I hadn’t introduced in my lessons yet. 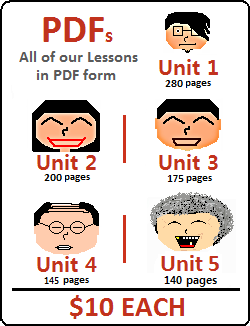 From start to finish, there were only a handful of grammatical principles that I haven’t introduced by this lesson. 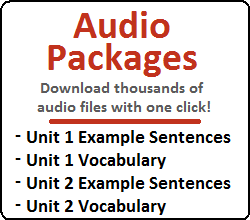 All of the grammatical principles that I haven’t introduced yet will be in upcoming lessons. However, there were some small things that, when reading them, I realized I hadn’t spent a large amount of time describing. I would like to take the opportunity in this lesson to teach you some grammatical principles that you probably should have learned before (by this point you may have already learned them somewhere else), but I never got around to teaching them to you. Enough of that – let’s get started. Okay, this one I actually have introduced. 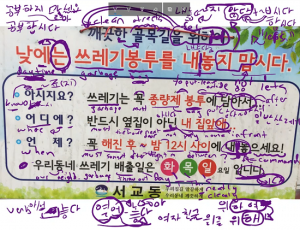 In Lesson 38 I taught you the words 떨어지다 and 떨어뜨리다. Though I mentioned those two words in the notes of that vocabulary list, I felt like I should formally introduce the difference between words ending in ~아/어지다 compared to words ending in ~아/어 뜨리다. As I mentioned in that lesson, words ending in ~아/어지다 are often passive words that have an active ~아/어뜨리다 equivalent. (Note that this is not the grammatical principle ~아/어지다 that gets added to adjectives – for example: 나쁘다 + ~아/어지다 = 나빠지다). I specifically wanted to introduce this here because a lot of the words I wanted to teach you in upcoming lessons had this ~아/어지다/뜨리다 form. Instead of introducing those words randomly throughout the next 20 lessons or so, I thought it would be better to introduce them all in one lesson and provide an explanation about them as well. (Just as a quick note – years ago I was confused with the difference 쓰러지다 and 무너지다, as the essentially mean the same thing. A Korean friend of mine told me that 쓰러지다 is if something were to fall over, like a tree getting blown down. However, 무너지다 is when something collapses within itself and doesn’t topple over, like when somebody purposely implodes a building to collapse on itself to prevent debris from hitting the next building. The end result is the same – that both structures have been leveled to the ground, but the process of them falling is slightly different). If you have been keeping up with your Hanja studies, you should know the character for 화 is 化. Other examples that you have already learned, and some that you haven’t yet (I’m going to include the Hanja characters that I have introduced in here as well for those that are practicing. If you haven’t started studying Hanja, I suggest that you take a look at the first 100 characters that I have introduced). If a Korean name ends with a 받침, you will commonly see “이” added between the name and the particles ~는/은, ~이/가 and ~를/을. From what I understand, this is entirely related to pronunciation. For example, if I say “희연은”, this actually sounds closer to “희여는”, which causes ambiguity as to what the person’s name actually is. Is her name 희여 or 희연? This would be the same with all names that end in a 받침. You should also know that even though there are a lot of letters in the Korean alphabet, you will probably only ever see the following used as the 받침 on the final syllable: ㄱ, ㅁ, ㄴ, ㅇ, ㄹ, ㅂ. Everybody would still understand what you want to say. Korean people just say “ahh, it sounds ‘느끼해’”. “느끼해” is usually the word Korean people use to describe when they eat too much pasta, bread, or something greasy, although it is also used to describe the feeling one gets when they hear something so lovey-dovey that it is corny. It’s hard even for me to completely understand this feeling of “느끼해”, and even if I did understand it, it would be hard to explain in words. You’re better off just using the rule of adding “이” to names ending in a받침 to be safe, unless you are writing a romance novel and want to sound “느끼해”. … and other adjectives that have ~아/어하다 attached to them. What is going on here? What is the difference between these two forms? Notice the adjectives that I listed above. What is common among all of those adjectives? They’re specifically describing a feeling that is elicited in somebody. If you are the speaker, and are describing somebody else, how can you know what they are feeling? In these cases, where the adjective being used is describing another person’s feelings, it is more natural to add ~아/어하다 to the adjective. Your sentence would still be understood if you didn’t attach this, but it sounds more natural with the addition. It would be weird to say the sentence above, but you might be able to find a sentence like that in a novel. In novels, authors need to describe the characters in a book, who most of the time are just figments of their own imagination. Therefore, in this case, it would be acceptable to just use “부끄러워” or “부러워” because the author knows for certain the emotion that is being elicited by the other person. Remember that ~싶다 in these cases is an adjective. You can also see here that it fits in with all the other adjectives above – that it is describing the feeling within somebody. In the examples above, if I changed the subject to another person, the sentences would be correct. However, if your friends were all talking about 과자, and were going around the room one by one and saying if they liked it or not, you could respond with just “나는 좋아해”. In that same respect, you couldn’t just say the examples above unless there was some sort of immediate understanding of what object was being referred to. This can be done any time somebody deserves a lot of respect, but it isn’t completely necessary. Failing to use the honorific ~요 or ~ㅂ/습니다 forms when speaking to somebody who deserves respect would most likely get you thrown out of a room. Okay! Click here to take me to the next lesson!